Bluffton is a hamlet in central Alberta, Canada within Ponoka County. 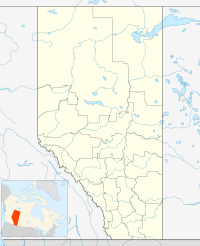 It is located 1 kilometre (0.62 mi) northeast of Highway 20, approximately 97 kilometres (60 mi) northwest of Red Deer. As a designated place in the 2016 Census of Population conducted by Statistics Canada, Bluffton recorded a population of 143 living in 60 of its 63 total private dwellings, a change of −5.9% from its 2011 population of 152. With a land area of 0.5 km2 (0.19 sq mi), it had a population density of 286.000286.0/km2 (740.737740.7/sq mi) in 2016. As a designated place in the 2011 Census, Bluffton had a population of 152 living in 61 of its 68 total dwellings, a 4.1% change from its 2006 population of 146. With a land area of 0.5 km2 (0.19 sq mi), it had a population density of 304.00304/km2 (787.4790/sq mi) in 2011. ^ Alberta Municipal Affairs (2010-04-01). "Specialized and Rural Municipalities and Their Communities" (PDF). Archived from the original (PDF) on 2012-02-29. Retrieved 2010-07-03. This page was last edited on 22 July 2017, at 08:19 (UTC).